Regulation (EC) No 715/2007 establishes common technical requirements for the type approval of motor vehicles (vehicles) and replacement parts with regard to their emissions and lays down rules for in-service conformity, durability of pollution control devices, on-board diagnostic (OBD) systems, measurement of fuel consumption and accessibility of vehicle repair and maintenance information. Commission Regulation (EC) No 692/2008 of 18 July 2008 implementing and amending Regulation (EC) No 715/2007 of the European Parliament and of the Council on type-approval of motor vehicles with respect to emissions from light passenger and commercial vehicles (Euro 5 and Euro 6) and on access to vehicle repair and maintenance information (3) requires the Commission to introduce the new test procedure for particle mass and numbers emitted by light duty vehicles. Council Directive 76/756/EEC of 27 July 1976 on the approximation of the laws of the Member States relating to the installation of lighting and light-signalling devices on motor vehicles and their trailers (4) requires the use of daytime running lamps for safety reasons. The effect of those devices, which are switched on permanently during the operation of vehicles, should be appropriately reflected in the measured pollutant and carbon dioxide (CO2) emissions. The risk of tampering with and total failures of diesel particle filters (DPFs) necessitates the monitoring of DPFs, regardless of the exceedance of the applicable OBD threshold limit. Due to its permanent nature, the monitoring of electric circuits should be exempt from the reporting resulting from the in-use-performance-ratio requirements on the OBD system. The limited frequency of driving situations during which monitors of the boost control system or monitors requiring a cold start can be operated requires special performance requirements for these monitors. The statistical conditions under which compliance with in-use-performance-ratio requirements is assessed by default should be harmonised. If tampering of the Selective Catalytic Reduction (SCR) system is identified by direct monitoring of nitrogen oxides (NOx) emissions, the conditions under which its driver inducement system is activated should be better defined. The recording of activation of the driver inducement system should be clarified with regard to possible future use of this information during roadworthiness inspections. The protection of the emission control computer against tampering should be open for technical improvements due to innovation. Recording and reporting of data are essential parts of a mandatory OBD monitor and should not be waived by alleged deficiencies, in particular not in a systematic manner where the manufacturer opts for certain standards for on/off board communication. In order to ensure effective competition on the market for vehicle repair and maintenance information services, and in order to clarify that the information concerned also covers information which needs to be provided to independent operators other than repairers, so as to ensure that the independent vehicle repair and maintenance market as a whole can compete with authorised dealers, regardless of whether the vehicle manufacturer gives such information to authorised dealers and repairers directly, further clarifications with regard to the details of the information to be provided under Regulation (EC) No 715/2007 are necessary. Considering the proportionality principle, while vehicle manufacturers should not be forced to collect data on modifications of individual vehicles from third parties exclusively for the purposes of Regulation (EC) No 715/2007 and its implementing acts, in order to ensure a competitive repair and maintenance market, independent operators should receive updates to vehicle component data to the extent the updates are available to authorised dealers and repairers. Work units are important technical repair and maintenance information for independent operators. Clarifying that work units are covered by Article 6 of Regulation (EC) No 715/2007 is expected to provide commercial certainty to the market players. Where vehicle manufacturers provide that repair and maintenance records are no longer kept in physical format — which vehicle owners can also make accessible to independent repairers for the latter to introduce a statement of the repair and maintenance work carried out — in the vehicle, but kept in the vehicle manufacturers’ central data base, these records must, with the consent of the vehicle owners, also be accessible by the independent repairer in order to allow them to continue to produce such complete record of the repair and maintenance work carried out and to enable vehicle owners to have a single document proving all such works. More flexibility should be given for the re-programming of vehicle control units and the data exchange between vehicle manufacturers and independent operators in order to allow for innovations and to save costs. It should be ensured that vehicles approved in accordance with the relevant Regulation from the United Nations Economic Commission for Europe (UN/ECE) equivalent to the emissions-related requirements of Regulation (EC) No 715/2007 and Regulation (EC) No 692/2008 and fulfilling the requirements of those Regulations on access to information are approved in accordance with Regulation (EC) No 715/2007 without administrative burdens. Since there is currently no common structured process for the exchange of vehicle component data between vehicle manufacturers and independent operators, it is appropriate to develop principles for such an exchange of data. A future common structured process on the standardised format of the data exchanged should be developed by the European Committee for Standardization (CEN) formally, whereupon the mandate given to CEN does not predetermine the level of detail this standard will provide. The CEN’s work should, in particular, reflect the interests and needs of vehicle manufacturers and independent operators alike and should also investigate solutions such as open data formats described by well defined meta-data to accommodate existing IT infrastructures. Regulations (EC) No 715/2007 and (EC) No 692/2008 should therefore be amended accordingly. ‘8. Where vehicle repair and maintenance records are kept in a central data base of the vehicle manufacturer or on its behalf, independent repairers, approved and authorised as required in point 2.2 of Annex XIV to Commission Regulation (EC) No 692/2008 (5), shall have access to such records free of charge and under the same conditions as authorised dealers or repairers in order to record information on repair and maintenance performed. in Annex I, notes 1 and 2 of Table 1 and notes 1, 2 and 5 of Table 2 are deleted. the vehicle has been approved according to UN/ECE Regulations No 83, series of amendments 06, No 101, series of amendments 01 and in the case of compression ignition vehicles No 24 Part III, series of amendments 03.
the replacement pollution control devices have been approved according to UN/ECE Regulation No 103. ‘9. The Forum on Access to Vehicle Information (the Forum) is hereby established. The Forum shall consider whether access to information affects the advances made in reducing vehicle theft and shall make recommendations for improving the requirements relating to access to information. In particular, the Forum shall advise the Commission on the introduction of a process for approving and authorising independent operators by accredited organisations to access information on vehicle security. Annex II is replaced by the text set out in Annex II to this Regulation. Done at Brussels, 8 June 2011. (3) OJ L 199, 28.7.2008, p. 1. (4) OJ L 262, 27.9.1976, p. 1. ‘Euro 5b emissions standard= Full Euro 5 emission requirements including revised measurement procedure for particulates, particle number standard and flex fuel vehicle low temperature emission testing with biofuel. Euro 6b emissions standard= Full Euro 6 emission requirements including revised measurement procedure for particulates, particle number standard and flex fuel vehicle low temperature emission testing with biofuel. Euro 5 OBD standards= Base Euro 5 OBD requirements excluding in-use-performance ratio (IUPR), NOx monitoring for petrol vehicles and tightened PM threshold limits for diesel. As from the dates laid down in Article 2 of Commission Directive 2008/89/EC (4) the daytime running lamps of the vehicle as defined in Section 2 of UN/ECE Regulation No 48 (5) shall be switched on during the test cycle. The vehicle tested shall be equipped with the daytime running lamp system that has the highest electrical energy consumption among the daytime running lamp systems, which are fitted by the manufacturer to vehicles in the group represented by the type-approved vehicle. The manufacturer shall supply appropriate technical documentation to the type-approval authorities in this respect. The manufacturer shall demonstrate to the approval authority and, upon request, to the Commission that these statistical conditions are satisfied for all monitors required to be reported by the OBD system according to point 3.6 of this Appendix not later than 18 months after the entry onto the market of the first vehicle type with IUPR in an OBD family and every 18 months thereafter. For this purpose, for OBD families consisting of more than 1 000 registrations in the Union, that are subject to sampling within the sampling period, the process described in Annex II shall be used without prejudice to the provisions of point 3.1.9 of this Appendix. In addition to the requirements set out in Annex II and regardless of the result of the audit described in Section 2 of Annex II, the authority granting the approval shall apply the in-service conformity check for IUPR described in Appendix 1 to Annex II in an appropriate number of randomly determined cases. “In an appropriate number of randomly determined cases” means, that this measure has a dissuasive effect on non-compliance with the requirements of Section 3 of this Annex or the provision of manipulated, false or non-representative data for the audit. If no special circumstances apply and can be demonstrated by the type-approval authorities, random application of the in-service conformity check to 5 % of the type approved OBD families shall be considered as sufficient for compliance with this requirement. 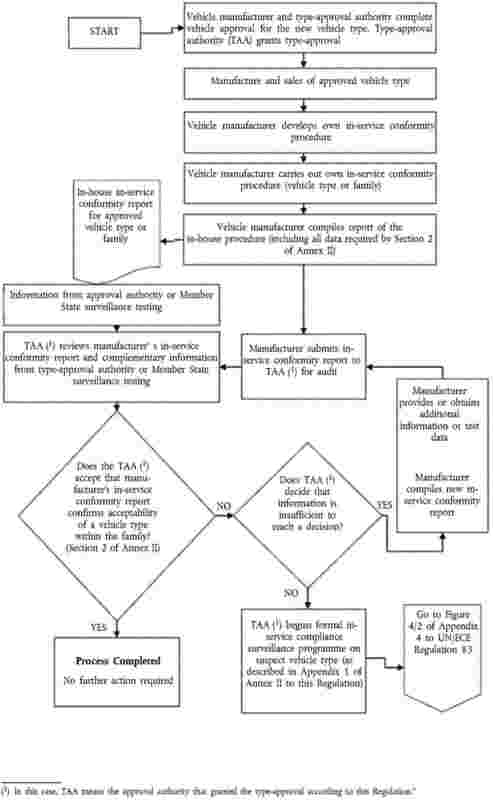 For this purpose, type-approval authorities may find arrangements with the manufacturer for the reduction of double testing of a given OBD family as long as these arrangements do not harm the dissuasive effect of the type-approval authority’s own in-service conformity check on non-compliance with the requirements of Section 3 of this Annex. Data collected by Member States during surveillance testing programmes may be used for in-service conformity checks. Upon request, type-approval authorities shall provide data on the audits and random in-service conformity checks performed, including the methodology used for identifying those cases, which are made subject to the random in-service conformity check, to the Commission and other type-approval authorities. ‘Information on all parts of the vehicle, with which the vehicle, as identified by the vehicle identification number (VIN) and any additional criteria such as wheelbase, engine output, trim level or options, is equipped by the vehicle manufacturer and which can be replaced by spare parts offered by the vehicle manufacturer to its authorised repairers or dealers or third parties by means of reference to original equipment (OE) parts number, shall be made available in a database easily accessible to independent operators. This database shall comprise the VIN, OE parts numbers, OE naming of the parts, validity attributes (valid-from and valid-to dates), fitting attributes and where applicable structuring characteristics. the independent operator’s private key shall be protected by secure hardware. The Forum on Access to Vehicle Information provided for by paragraph 9 of Article 13 will specify the parameters for fulfilling these requirements according to the state-of-the-art. The independent operator shall be approved and authorised for this purpose on the basis of documents demonstrating that they pursue a legitimate business activity and have not been convicted of relevant criminal activity. Reprogramming of control units of vehicles manufactured later than 31 August 2010 shall be conducted in accordance with either ISO 22900 or SAE J2534, regardless of the date of type approval. For the validation of the compatibility of the manufacturer-specific application and the vehicle communication interfaces (VCI) complying to ISO 22900 or SAE J2534, the manufacturer shall offer either a validation of independently developed VCIs or the information, and loan of any special hardware, required for a VCI manufacturer to conduct such validation himself. The conditions of Article 7(1) of Regulation (EC) No 715/2007 apply to fees for such validation or information and hardware. Vehicle electric range … km (according to Annex 9 to UN/ECE Regulation No 101)’. (1) Where a bi fuel vehicle is combined with a flex fuel vehicle, both test requirements are applicable. (2) This provision is temporary, further requirements for biodiesel and hydrogen shall be proposed later on. (4) OJ L 257, 25.9.2008, p. 14. (6) The values referred to in the specifications are “true values”. When establishing the value limits, the terms of ISO 4259 Petroleum products — Determination and application of precision data in relation to methods of test were applied. When fixing a minimum value, a minimum difference of 2R above zero was taken into account. When fixing a maximum and minimum value, the minimum difference used was 4R (R = reproducibility). Notwithstanding this procedure, which is necessary for technical reasons, fuel manufacturers shall aim for a zero value where the stipulated maximum value is 2R and for the mean value for quotations of maximum and minimum limits. Where it is necessary to clarify whether fuel meets the requirements of the specifications, the ISO 4259 terms shall be applied. (7) In cases of dispute, the procedures for resolving the dispute and interpretation of the results based on test method precision, described in EN ISO 4259 shall be used. (8) In cases of national dispute concerning sulphur content, either EN ISO 20846 or EN ISO 20884 shall be called up similar to the reference in the national annex of EN 228. (9) The actual sulphur content of the fuel used for the Type 6 test shall be reported. (10) The unleaded petrol content may be determined as 100 minus the sum of the percentage content of water and alcohols. (11) There shall be no intentional addition of compounds containing phosphorus, iron, manganese, or lead to this reference fuel. 1.1. This Annex sets out the tailpipe emissions and OBD (inclusive IUPRM) in-service conformity requirements for vehicles type approved to this Regulation. 2.1. The audit of in-service conformity by the approval authority shall be conducted on the basis of any relevant information that the manufacturer has, under the same procedures as those for the conformity of production defined in Article 12(1) and (2) of Directive 2007/46/EC and in points 1 and 2 of Annex X to that Directive. Information from approval authority and Member State surveillance testing may complement the in-service monitoring reports supplied by the manufacturer. 2.2. The figure referred to in point 9 of Appendix 2 to this Annex and Figure 4/2 of Appendix 4 to UN/ECE Regulation No 83 (for tailpipe emissions only) illustrates the procedure for in-service conformity checking. The process for in-service conformity is described in Appendix 3 to this Annex. 2.3. As part of the information provided for the in-service conformity control, at the request of the approval authority, the manufacturer shall report to the type-approval authority on warranty claims, warranty repair works and OBD faults recorded at servicing, according to a format agreed at type-approval. The information shall detail the frequency and substance of faults for emissions-related components and systems. The reports shall be filed at least once a year for each vehicle model for the duration of the period defined in Article 9(4) of this Regulation. engine cylinder capacity of the largest engine within the family minus 30 %. The percentage of selected vehicles, which have an IUPRM greater or equal to the minimum value applicable to the monitor according to points 3.1.4 and 3.1.5 of Appendix 1 to Annex XI. 3.1. The information gathered by the manufacturer shall be sufficiently comprehensive to ensure that in-service performance can be assessed for normal conditions of use. The manufacturer’s sampling shall be drawn from at least two Member States with substantially different vehicle operating conditions (unless only sold in one Member State). Factors such as differences in fuels, ambient conditions, average road speeds, and urban/highway driving split shall be taken into consideration in the selection of the Member States. For OBD IUPRM testing only vehicles fulfilling the criteria of point 2.2.1 of Appendix 1 shall be included in the test sample. 3.2. In selecting the Member States for sampling vehicles, the manufacturer may select vehicles from a Member State that is considered to be particularly representative. In this case, the manufacturer shall demonstrate to the approval authority which granted the type approval that the selection is representative (e.g. by the market having the largest annual sales of a vehicle family within the Union). When a family requires more than one sample lot to be tested as defined in point 3.5, the vehicles in the second and third sample lots shall reflect different vehicle operating conditions from those selected for the first sample. 3.3. The emissions testing may be done at a test facility which is located in a different market or region from where the vehicles have been selected. 3.4. The in-service tailpipe emissions conformity tests by the manufacturer shall be continuously carried out reflecting the production cycle of applicable vehicles types within a given in-service vehicle family. The maximum time period between commencing two in-service conformity checks shall not exceed 18 months. In the case of vehicle types covered by an extension to the type-approval that did not require an emissions test, this period may be extended up to 24 months. For IUPR, the number of sample lots to be taken is described in the table in point 3.5.1 and is based on the number of vehicles of an OBD family that are approved with IUPR (subject to sampling). For the first sampling period of an OBD family, all of the vehicle types in the family that are approved with IUPR shall be considered to be subject to sampling. For subsequent sampling periods, only vehicle types which have not been previously tested or are covered by emissions approvals that have been extended since the previous sampling period shall be considered to be subject to sampling. For families consisting of fewer than 5 000 EU registrations that are subject to sampling within the sampling period the minimum number of vehicles in a sample lot is six. For all other families, the minimum number of vehicles in a sample lot to be sampled is fifteen. Each sample lot shall adequately represent the sales pattern, i.e. at least high volume vehicle types (≥ 20 % of the family total) shall be represented. decide that the in-service conformity of a vehicle type, that is part of an in-service family, or of an OBD family, is unsatisfactory and proceed to have such vehicle type or OBD family tested in accordance with Appendix 1. If according to the IUPRM audit the test criteria of point 6.1.2 point (a) or (b) of Appendix 1 are met for the vehicles in a sample lot, the type-approval authority must take the further action described in point (d) of this point. 4.1. Where type 1 tests are considered necessary to check the conformity of emission control devices with the requirements for their performance while in service, such tests shall be carried out using a test procedure meeting the statistical criteria defined in Appendix 2. 4.2. The approval authority, in cooperation with the manufacturer, shall select a sample of vehicles with sufficient mileage whose use under normal conditions can be reasonably assured. The manufacturer shall be consulted on the choice of the vehicles in the sample and allowed to attend the confirmatory checks of the vehicles. 4.3. The manufacturer shall be authorised, under the supervision of the approval authority, to carry out checks, even of a destructive nature, on those vehicles with emission levels in excess of the limit values with a view to establishing possible causes of deterioration which cannot be attributed to the manufacturer (e.g. use of leaded petrol before the test date). Where the results of the checks confirm such causes, those test results shall be excluded from the conformity check. This Appendix sets out the criteria referred to in Section 4 regarding the selection of vehicles for testing and the procedures for the in-service conformity control. The criteria for acceptance of a selected vehicle are defined for tailpipe emissions in points 2.1 to 2.8 and for IUPRM in Sections 2.1 to 2.5. The vehicle shall belong to a vehicle type that is type-approved under this Regulation and covered by a certificate of conformity in accordance with Directive 2007/46/EC. For checking of IUPRM, the vehicle shall be approved to the OBD standards Euro 5+, Euro 6- plus IUPR or later. It shall be registered and have been used in the Union. The vehicle shall have been in service for at least 15 000 km or 6 months, whichever the later, and for no more than 100 000 km or 5 years, whichever the sooner. have collected sufficient vehicle operation data for the monitor to be tested. have not been tampered with or equipped with add-on or modified parts that would cause the OBD system not to comply with the requirements of Annex XI. There shall be a maintenance record to show that the vehicle has been properly maintained (e.g. has been serviced in accordance with the manufacturer’s recommendations). The vehicle shall exhibit no indications of abuse (e. g. racing, overloading, mis-fuelling, or other misuse), or other factors (e. g. tampering) that could affect emission performance. The fault code and mileage information stored in the computer shall be taken into account. A vehicle shall not be selected for testing if the information stored in the computer shows that the vehicle has operated after a fault code was stored and a relatively prompt repair was not carried out. There shall have been no unauthorised major repair to the engine or major repair of the vehicle. The lead content and sulphur content of a fuel sample from the vehicle tank shall meet the applicable standards laid down in Directive 98/70/EC of the European Parliament and of the Council (1) and there shall be no evidence of mis-fuelling. Checks may be done in the tailpipe. There shall be no indication of any problem that might jeopardise the safety of laboratory personnel. All anti-pollution system components on the vehicle shall be in conformity with the applicable type-approval. Diagnosis and any normal maintenance necessary shall be performed on vehicles accepted for testing, prior to measuring exhaust emissions, in accordance with the procedure laid down in points 3.1 to 3.7. The following checks shall be carried out: checks on air filter, all drive belts, all fluid levels, radiator cap, all vacuum hoses and electrical wiring related to the antipollution system for integrity; checks on ignition, fuel metering and pollution control device components for maladjustments and/or tampering. All discrepancies shall be recorded. The OBD system shall be checked for proper functioning. Any malfunction indications in the OBD memory shall be recorded and the requisite repairs shall be carried out. If the OBD malfunction indicator registers a malfunction during a preconditioning cycle, the fault may be identified and repaired. The test may be rerun and the results of that repaired vehicle used. The ignition system shall be checked and defective components replaced, for example spark plugs, cables, etc. The compression shall be checked. If the result is unsatisfactory the vehicle shall be rejected. The engine parameters shall be checked to the manufacturer’s specifications and adjusted if necessary. If the vehicle is within 800 km of a scheduled maintenance service, that service shall be performed according to the manufacturer’s instructions. Regardless of odometer reading, the oil and air filter may be changed at the request of the manufacturer. Upon acceptance of the vehicle, the fuel shall be replaced with appropriate emission test reference fuel, unless the manufacturer accepts the use of market fuel. When a check on vehicles is deemed necessary, emission tests in accordance with Annex III are performed on pre-conditioned vehicles selected in accordance with the requirements of Sections 2 and 3 of this Appendix. This test shall only include the measurement of particle number emissions for vehicles approved to the Euro 6 emission standards in categories W, X and Y as defined in Table 1 of Appendix 6 to Annex I. Pre-conditioning cycles additional to those specified in points 5.3 of Annex 4 to UN/ECE Regulation No 83 will only be allowed if they are representative of normal driving. Vehicles equipped with an OBD system may be checked for proper in-service functionality, of the malfunction indication, etc., in relation to levels of emissions (e.g. the malfunction indication limits defined in Annex XI) for the type-approved specifications. The OBD system may be checked, for example, for levels of emissions above the applicable limit values with no malfunction indication, systematic erroneous activation of the malfunction indication and identified faulty or deteriorated components in the OBD system. If a component or system operates in a manner not covered by the particulars in the type-approval certificate and/or information package for such vehicle types and such deviation has not been authorised under Article 13(1) or (2) of Directive 2007/46/EC, with no malfunction indication by the OBD, the component or system shall not be replaced prior to emission testing, unless it is determined that the component or system has been tampered with or abused in such a manner that the OBD does not detect the resulting malfunction. The test results shall be submitted to the evaluation procedure in accordance with Appendix 2. Test results shall not be multiplied by deterioration factors. the conditions set out in point 3.2.4 of Appendix 4 to UN/ECE Regulation No 83 where the approval authority has determined that the excess emission is due to the same cause. For vehicles certified to a ratio of 0,1 in accordance with point 3.1.5 of Appendix 1 to Annex XI, the data collected from the vehicles indicate for at least one monitor M in the test sample either that the test sample average in-use-performance ratio is less than 0,1 or that 66 % or more of the vehicles in the test sample have an in-use monitor performance ratio of less than 0,1. For vehicles certified to the full ratios in accordance with point 3.1.4 of Appendix 1 to Annex XI, the data collected from the vehicles indicate for at least one monitor M in the test sample either that the test sample average in-use performance ratio in the test sample is less than the value Testmin(M) or that 66 % or more of the vehicles in the test sample have an in-use performance ratio of less than Testmin(M). according to point 3.1.4 of Appendix 1 to Annex XI. The plan of remedial measures shall be filed with the type-approval authority not later than 60 working days from the date of the notification referred to in point 6.1. The type-approval authority shall within 30 working days declare its approval or disapproval of the plan of remedial measures. However, where the manufacturer can demonstrate, to the satisfaction of the competent approval authority, that further time is required to investigate the non-compliance in order to submit a plan of remedial measures, an extension shall be granted. The remedial measures shall apply to all vehicles likely to be affected by the same defect. The need to amend the type-approval documents shall be assessed. The manufacturer shall provide a copy of all communications related to the plan of remedial measures, and shall also maintain a record of the recall campaign, and supply regular status reports to the approval authority. The plan of remedial measures shall include the requirements specified in points 6.5.1 to 6.5.11. The manufacturer shall assign a unique identifying name or number to the plan of remedial measures. A description of each vehicle type included in the plan of remedial measures. A description of the specific modifications, alterations, repairs, corrections, adjustments or other changes to be made to bring the vehicles into conformity including a brief summary of the data and technical studies which support the decision of the manufacturer as to the particular measures to be taken to correct the non-conformity. A description of the method by which the manufacturer informs the vehicle owners. A description of the proper maintenance or use, if any, which the manufacturer stipulates as a condition of eligibility for repair under the plan of remedial measures, and an explanation of the reasons why the manufacturer imposes any such condition. No maintenance or use conditions may be imposed unless it is demonstrably related to the non-conformity and the remedial measures. A description of the procedure to be followed by vehicle owners to obtain correction of the non-conformity. This description shall include a date after which the remedial measures may be taken, the estimated time for the workshop to perform the repairs and where they can be done. The repair shall be done expediently, within a reasonable time after delivery of the vehicle. A copy of the information transmitted to the vehicle owner. A brief description of the system which the manufacturer uses to assure an adequate supply of component or systems for fulfilling the remedial action. It shall be indicated when there will be an adequate supply of components or systems to initiate the campaign. A copy of all instructions to be sent to those persons who are to perform the repair. A description of the impact of the proposed remedial measures on the emissions, fuel consumption, driveability, and safety of each vehicle type, covered by the plan of remedial measures with data and technical studies which support these conclusions. Any other information, reports or data the type-approval authority may reasonably determine is necessary to evaluate the plan of remedial measures. Where the plan of remedial measures includes a recall, a description of the method for recording the repair shall be submitted to the type-approval authority. If a label is used, an example of it shall be submitted. The manufacturer may be required to conduct reasonably designed and necessary tests on components and vehicles incorporating a proposed change, repair, or modification to demonstrate the effectiveness of the change, repair, or modification. The manufacturer is responsible for keeping a record of every vehicle recalled and repaired and the workshop which performed the repair. The type-approval authority shall have access to the record on request for a period of 5 years from the implementation of the plan of remedial measures. The repair and modification or addition of new equipment shall be recorded in a certificate supplied by the manufacturer to the vehicle owner. This procedure shall be used to verify the in-service conformity requirements for the type 1 test. The applicable statistical method set out in Appendix 4 to UN/ECE Regulation No 83 shall apply, with the exceptions described in the Sections 2 to 9 of this Appendix. Note 1 shall not apply. A vehicle is said to be an outlying emitter when the conditions given in point 3.2.2 are met. Point 3.2.1 shall not apply. In point 3.2.2, the reference to row B of the table in point 5.3.1.4 shall be understood as reference to Table 1 of Annex I to Regulation (EC) No 715/2007 for Euro 5 vehicles and to Table 2 of Annex I to Regulation (EC) No 715/2007 for Euro 6 vehicles. In points 3.2.3.2.1 and 3.2.4.2, the reference to Section 6 of Appendix 3 shall be understood as reference to Section 6 of Appendix 1 to Annex II to this Regulation. In notes 2 and 3, the reference to row A of the table in point 5.3.1.4 shall be understood as reference to Table 1 of Annex I to Regulation (EC) No 715/2007 for Euro 5 vehicles and to Table 2 of Annex I to Regulation (EC) No 715/2007 for Euro 6 vehicles. In point 4.2, the reference to point 5.3.1.4 shall be understood as reference to Table 1 of Annex I to Regulation (EC) No 715/2007 for Euro 5 vehicles and Table 2 of Annex I to Regulation (EC) No 715/2007 for Euro 6 vehicles. 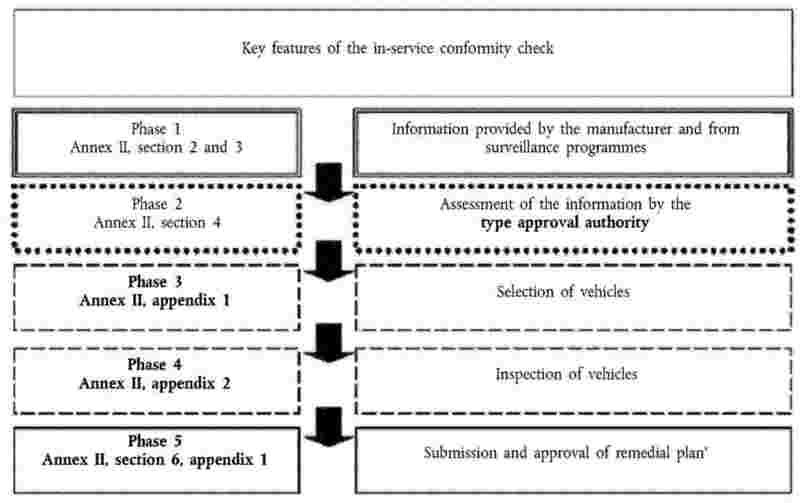 The process of checking in-service conformity check is illustrated in Figure 1. The manufacturer shall compile all the information needed to comply with the requirements of this Annex. The approval authority may also take information from surveillance programmes into consideration. The approval authority shall conduct all the procedures and tests necessary to ensure that the requirements regarding the in-service conformity are met. (Phases 2 to 4). In the event of discrepancies or disagreements in the assessment of information supplied, the approval authority shall request clarification from the technical service that conducted the type-approval test. The manufacturer shall establish and implement a plan of remedial measures. This plan shall be approved by the approval authority before it is implemented (Phase 5). (1) OJ L 350, 28.12.1998, p. 58.